This fantastic shooter that tells us the alternative version of the history, in which Nazi Germany won World War II, is to be released in May 2014, so Bethesda company continues to promote its upcoming project very actively. Thus, following the publication of some screenshots at the end of February, yesterday the developers shared the fresh Wolfenstein: The New Order trailer. 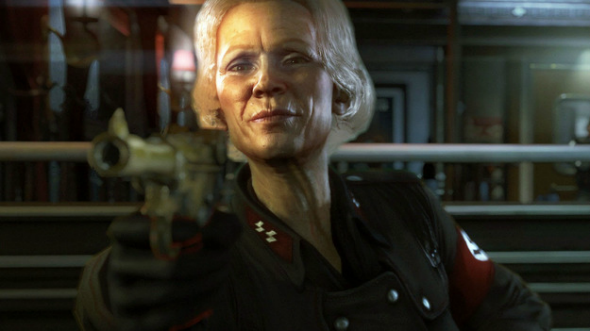 This Wolfenstein: The New Order video introduces us to Frau Irene Engel - the military officer, who dedicated her whole life to the service of the Aryan ideals. The protagonist - William Joseph Blazkowicz - meets Frau Engel in the buffet car of the train, going from Poland to Berlin, for the first time. The Wolfenstein: The New Order trailer shows a scene, in which the officer offers William to play one very tricky game and choose the right card. Besides that, you may also see another character, which the players will meet during the game, - a giant robot killer. Moreover, Bethesda company has shared the second Wolfenstein: The New Order video that contains the interview with the MachineGames’ narrative designer - Tommy Bjork. Bjork tells about the creation of the shooter’s levels and Frau Engel character, which, according to Tommy, is his “proudest moment”, because not each game has such a great female villain. So, did you like the Wolfenstein: The New Order videos? What do you think about the appearing of such negative character as Frau Engel in the game? We’ll be glad to see your comments below.